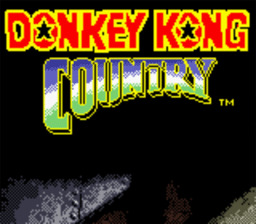 Storms lashed the rugged terrain of Kong Island, and outside Donkey Kong's treehouse, Diddy shivered. DK had assigned him to guard duty on this awful night as part of his "hero training," and he was not happy about it... But a rustling in the undergrowth soon brought him out of his reverie. "W-w-who goes there?!?" Diddy called. There was no answer but the flashing of claws and teeth. Diddy somersaulted into the fray but was quickly overcome by the weight of many scaly assailants. "It'sss the sssmall one...Ssseal him inssside thisss barrel and tosss it into the bussshesss... Donkey Kong'sss bananasss are oursss!" came a sinister voice. The next morning, Donkey Kong awoke to the familiar rasping voice of Cranky Kong. "Take a look inside your banana cave," Cranky cackled from outside his treehouse. "You're in for a big surprise!" "Diddy... gone... my little buddy..." DK murmured to himself. He was suddenly filled with conviction. "The Kremlings will pay!" he raged. "I'll hunt them down through every corner of my island, until I have every last banana from my hoard back!" --From the GBC Donkey Kong Country instruction manual.